Information security is too sensitive an asset to be vested in the hands of one person or a department. It is crucial for the entire organization. Having an enterprise security architecture shows that a comprehensive security plan is more valuable than purchasing a security software. To have a systematized security architecture, a planned framework for developing and maintaining security is a proactive approach. By implementing a formal security architecture in the enterprise, you are allowing your organization to integrate security in the business objectives. The result being achieving consistency and transparency throughout the organization. A security architect’s role is vital in the organization when designing systems, training employees, and evolving security needs. 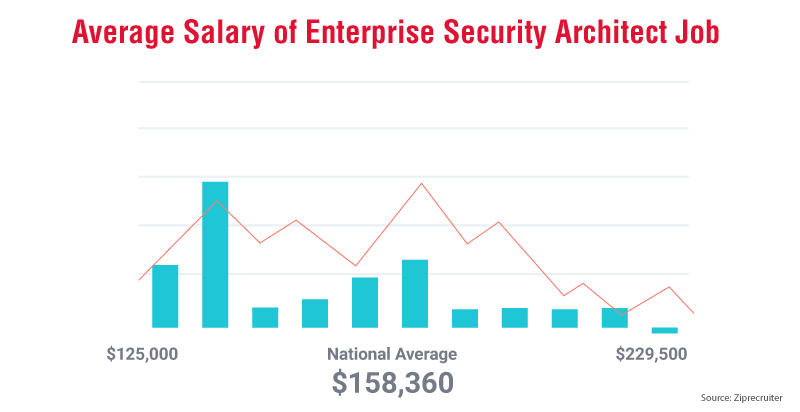 As an enterprise security architect, you will be responsible for the overall security system of the organization. You will have the opportunity to rise to a senior-level position once you gain extensive experience and the required credentials in the cybersecurity industry. Understanding and evolving security requirements at various levels in the organization. Reviewing current security architect framework and recommending enhancements. Conducting regular systems and network tests and ensuring continuous monitoring of the security system. If required, hire a penetration tester to perform a pen testing and address the vulnerabilities located, if any. Anticipating possible threats to identify areas of weaknesses. Ensuring access control based on requirement and role. Regularly upgrading systems with projected timelines. Responding promptly and effectively to the possible breaches and providing post-event analysis. Conducting breach of security drills and establishing disaster recovery processes. As a security architect for the enterprise you may have to behave tough and implement policies that are robust and rigid. You can implement policies where no workstation shall be left unattended for security verification and every employee will have to go through physical screening while entering and exiting the premises. An enterprise security architect is a managerial role where you coordinate with other managers to implement employee protocols to establish system integrity. These protocols are in-line with high-level security standards, especially, when dealing with data of national importance. As a manager responsible for overall security of the enterprise, you need to organize training for your employees, interview new walk-ins, and allow people to exit, when necessary. You must ensure that the security policies are been communicated to the new entrants and access to data has been removed immediately from those who have left the organization. When a new security strategy is rolled out, it falls on you to instruct the staff about the updates and ensure adherence. You are expected to stay abreast with the current trends in the field of security. If required, you may have to attend security related events and keep up with the latest industry publications. Remaining in-line with the latest trends equips you with the understanding to assess when and how to upgrade your security system. As a manager, you may need to monitor the roll out of new security software packages. You must ensure the integrity of the overall network while your team struggles with the uninstallation and installation of the new software. On completion of the update you may need to perform a new audit to reveal glitches, if any. Good understanding of security protocols, authentication, authorization, and security. Solid knowledge of Windows, Unix and Linux operating systems. Knowledge of cyber laws and ethics. Good knowledge in risk management and assessment procedures. Should be experienced in implementing single sign-on, multi-factor authentication and identity management. Effective business acumen and a commercial outlook. Note: Earning potential is based on the candidate’s efficacy in the subject and the discretion of an organization. ECCU programs provide the required knowledge and skills to enhance your ability in the selected domain. It is the student’s responsibility to exploit the resources and support extended by university and harness the required capability to compliment the earning potential, as per industry standards. EC-Council University offers a Master of Science in Cybersecurity degree program which is an online degree program for cybersecurity professionals. The program further offers specializations in five cybersecurity domains, the foremost being, Enterprise Security Architect. It focuses on the architectural design of a complete network security infrastructure of an organization. The program concentrates on technical as well as other business and managerial skills to equip you with all the skills to lead a cybersecurity team in the organization.